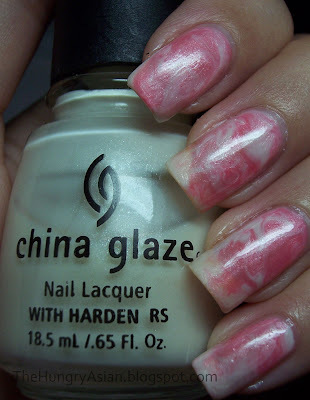 For my breast cancer awareness mani I used China Glaze White Ice and Loreal Trust Fund Baby to make this marbled design. 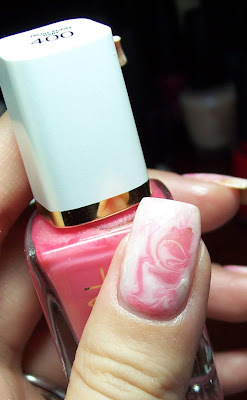 Any water marbling attempts by me = epic failure so I used the same method as my last marbled mani. I just put drops a few drops of each color on my nail (plain only with basecoat) and swirled them together using a dotting tool. You could also use a toothpick or anything small. Sorry my pictures are so dark but it was too late when I realized they all came out bad! Really pretty. So sweet and fluffy. Your pictures look fine. Love the manicure. An easier way than the water method. Very pretty manicure. Very pretty! I tried marbling recently as well. It's not that easy. I had to redo 6 fingers! Very frustrating. Will try your method next time. That is so awesome! It really does mimic cotton candy. Nice work! That's amazing! & it is not an epic fail! You should see my nails, now that's an epic fail! !